I love unusual little things – handy tools that tuck into pockets or small pouches, ordinary accessories that are made with a special touch, small gifts that don’t break the bank yet bring smiles and joy. Naturally, that means I delight in the holiday season and the chance to search for little treasures to surprise my family and friends. Part of the joy for me is finding something special that the giftee can use in creating things. Don’t get me wrong, nothing beats a box of bonbons, but I am a practical person and want the gift to be useful and long lasting. With that in mind, I cast my eye around the weaving and spinning realm to see what little delights fit the bill. 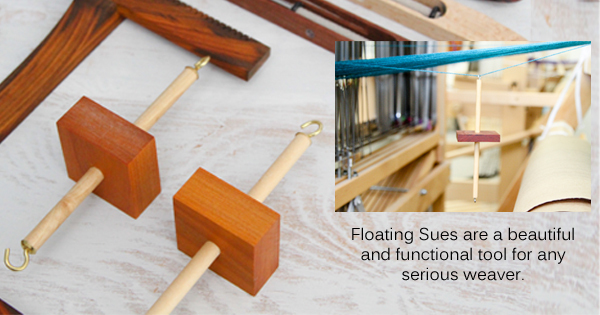 First there are the unsung heroines of weaving – the Floating Sues, made by Jim Hokett. These beautiful gadgets fall into the category of “that’s so simple, I could have made it myself”, which then leads to “but why would I make them when these are so beautiful and such a great deal”. Floating Sues look like a spindle with hooks on both ends and a beautiful chunk of wood in the middle. They are made to hang on floating selvages or to weight down broken warp ends. After years of dealing with canisters of pennies and fishing weights, I love the simplicity and ease of these. They come in 2 size options and if I need more weight I can add something on the bottom hook. For spinners, we recently started carrying Snyder Spindles, wonderful little Turkish drop spindles made from beautiful woods or with colorful 3D printed arms. I wrote about them in the this post last month, so it felt like cheating to go on about them again, so I turned my gaze farther afield and spied the shimmery braids of 50/50 Merino Tencel Top from Frabjous Fibers. I know it’s a bit fluffy to stuff into a pocket, but it’s a wonderful gift, nonetheless. It’s something new and different, the colorways are dreamy and that shine! 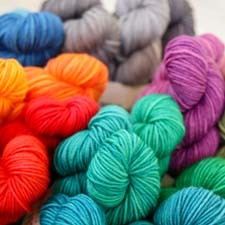 I envision spinning a lightweight 2-ply to knit into a sensuous shawl. And for those of you in our neck of the woods, drop by the store to see the gift table up front. There are many small trinkets we brought in just for the holidays, all of them fiber-related and fun – gift tags, mugs, laser-carved wooden gauges and ornaments and more. They are here for now and in small quantities, so you will only find them in the store. Come in and take a look! This entry was posted on Wednesday, December 7th, 2016 at 1:07 pm	and is filed under Products at WEBS, Spinning, Weaving. You can follow any responses to this entry through the RSS 2.0 feed. You can skip to the end and leave a response. Pinging is currently not allowed.